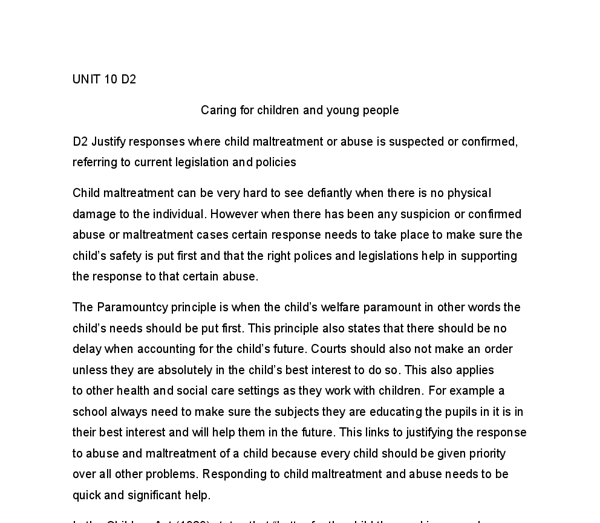 ﻿UNIT 10 D2 Caring for children and young people D2 Justify responses where child maltreatment or abuse is suspected or confirmed, referring to current legislation and policies Child maltreatment can be very hard to see defiantly when there is no physical damage to the individual. However when there has been any suspicion or confirmed abuse or maltreatment cases certain response needs to take place to make sure the child?s safety is put first and that the right polices and legislations help in supporting the response to that certain abuse. The Paramountcy principle is when the child?s welfare paramount in other words the child?s needs should be put first. This principle also states that there should be no delay when accounting for the child?s future. Courts should also not make an order unless they are absolutely in the child?s best interest to do so. This also applies to other health and social care settings as they work with children. For example a school always need to make sure the subjects they are educating the pupils in it is in their best interest and will help them in the future. This links to justifying the response to abuse and maltreatment of a child because every child should be given priority over all other problems. Responding to child maltreatment and abuse needs to be quick and significant help. 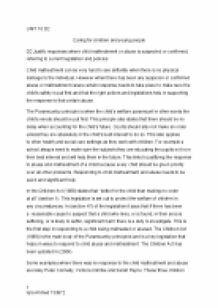 In the Children Act (1989) states that ?better for the child than making no order at all? (section 1). This legislation is set out to protect the welfare of children in any circumstances. ...read more. This legislation protects all details from bank statements to the place a person was born. When a child is abused or maltreated there does need to be a breakdown of this legislation. In Section 28 National securities. ?Any processing for the purpose of safeguarding national security is excused from all the data protection principles.? The data protection principles cover personal data being obtained, personal data also being kept up to date and many more regulations to how personal data of an individual should be protected. Abuse and maltreatment of a child is included in this exempt and there for when a child discloses information such as abuse or maltreatment the data protection act is exempt to a certain extent. For example the information told to the individual should be kept within a group of people who need to know for further procedures of the child safety to take place. This can be very difficult to explain to a child who has understanding s of their rights and wants the information to be kept confidential. However there are procedures put in place to make it easier for the child to accept that certain people will have to know about the abuse or maltreatment for him or her to get help. A policy closely linked to this legislation is the confidentiality policy. This is a further break down of the legislation. In a health and social care setting confidentiality policies are put in place to provide a breakdown of the data protection act. ...read more. The policy related to this response is safeguarding children policy. This policy has a range of ways to respond to child abuse and maltreatment but many focuses on how the staff of health and social care settings should be trained in making sure they know when there is a form of abuse taking place. For example having training for individuals about the indicators of physical, sexual, emotional abuse also there should be training for the risks of maltreatment. There are legal obligations for health and social care services to be able to provide training. Child welfare is a big agency that provides training on abuse and child protection (child welfare: online: 2000). Training also teaches staff and carers to understand how to report acts of abuse or maltreatment seen or believed to have happened. Overall in this criterion there have been four different responses justified and how the legislations and policies are closely related to the responses to child abuse and maltreatment. The importance of responding to abuse in the right way is unfathomable. There are so many cases of child abuse and maltreatment according to the World Health Organisation (2006: online) estimated that child maltreatment is responsible for 0.6 % of all child deaths worldwide and 12.7% of all deaths related to injury. This shows that responding to abuse needs to be quick and sufficient so that the child does not feel like they are being blamed for the incident or the carer workers do not cause any further harm to the child or even themselves responding to child abuse and maltreatment is fundamental in health and social care. ...read more. It is very important that people to have enough money to afford any health care they need. Further, a good financial state will enable us to eat a balanced diet by allowing us to buy any food. This can improve our physical health. Positive Factors in her life: Even though she has many problems and things that she faces in her life she has had things that affected her life positively. These are: 1. She has many friends who support her through all her difficulties. Political Environment - Decisions made by governments, where health funds are allocated, health legislation, prevention programs. Economic and Social Environment- s/e status (education levels, employment, income, financial support), Social Factors, Family, Work. vs/e status experience greater stress, sense of despair and lack of control- poorer health. - Eg. Air pollution>Respi. I used signs such as thumbs up (meaning good) and open palm (meaning stop) during the interaction, as signs can often promote effective communication and reduce barriers to interactions. One-to-one communication- Reading a book with a service user With the one-to one and communication interaction that I had with Nicky out chairs were put opposite one another so that we were able to see and hear each other clearly.